Why do greyhounds require muzzles? How much does it cost to become a Greenhound? What is an Approved Assessor? How do I find an Approved Assessor? Does my greyhound have to wear it's Greenhound collar all the time? I adopted my greyhound as a puppy. Do they need to get a Greenhound collar? Why is the course so long? I’ve had my greyhound for ages and they already know everything in the workbook. What do I do if my greyhound fails the assessment? Under the Companion Animals Act, any greyhound (pet and racing) who has not gained a muzzling exemption through Greenhounds must be muzzled when in public. While most greyhounds are gentle, affectionate, good natured and friendly, there is still a need for them to be assessed for suitability due to their previous training and instincts. Luckily, more than 90% of greyhounds who undertake the Greenhound program pass their assessment. A Greenhound is a pet or retired racing greyhound who has successfully completed an approved greyhound re-training program and passed a required assessment to gain a muzzle exemption. Greenhounds do not have to wear a muzzle when in public while under the control of a responsible person, but must wear a special “Greenhound collar” to identify them as muzzle exempt. The cost to become a Greenhound can vary. For greyhounds adopted through an adoption program such as Greyhounds As Pets, the cost of a Greenhound assessment and collar may be included in an adoption fee. If the assessment and collar are not included in an adoption fee, the price will then be dependent on the rate of each individual assessor. These prices may range from $100-250 depending on location and travel costs. 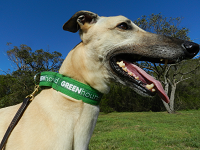 If a greyhound passes the assessment, the cost of Greenhound collar is $49.50 including postage and GST. An approved assessor is a suitably qualified person authorised by Greenhounds to conduct behavioural assessments on greyhounds. All greyhounds applying for a muzzling exemption must be assessed by an approved assessor. Greenhound assessors are required to undergo a TAFE course which includes classroom and practical sessions in order to gain their “approved” status in accordance with the government guidelines. There are many approved assessors located throughout NSW. Most are located within the Sydney metropolitan area, however, there are also many located in regional areas of the state too. A local assessor can be found using the handy map tool here. If there are no assessors in your immediate area, Greenhounds suggest contacting an assessor who may be willing to travel. Does a greyhound have to wear its Greenhound collar all the time? 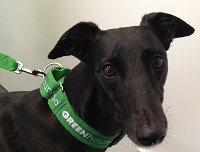 A greyhound must wear its Greenhound collar at all times while out in public if they are not wearing a muzzle. Fines do apply. In off- lead dogs parks, Greenhounds strongly recommend that a muzzle is still utilized unless on a leash, regardless whether your Greyhound is wearing its Greenhounds collar or not. 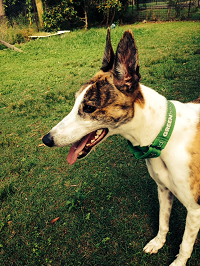 In private areas such as a home or backyard, a greyhound is not required to wear a Greenhound collar or a muzzle. If a greyhound has been ear-branded, they will need to complete the Greenhound program in order to gain a muzzling exemption. If a greyhound has not been ear-branded, they will need to be identified as a greyhound cross on the NSW Companion Animals register. In this instance, they will then not be legally required to wear a muzzle. Why is the course so long? I’ve had my greyhound for some time and they already know everything in the workbook. It is acknowledged that if a greyhound has been a pet for some time, some parts of the Greenhound program may seem very basic. However, it has been developed to also take into account the greyhounds who are new to pet life - some of whom may have come straight from the race track or an impound facility. The six week period will give these greyhounds time to relax and unwind and assimilate into pet life and give them the best chance of a positive outcome on assessment. Greenhounds always reccommend though that owners still go through the workbook to revisit any skills or training that may need to be reinforced. No need to worry! An owner can undertake the assesment as many times as they like. After a greyhound undergoes the Greenhound assessment, the approved assessor will run through any areas that need to be worked on if a greyhound did not pass. Greenhounds recommends that owners practise and provide a greyhound with more training in any trouble areas before booking in to do another assessment. This will hopefully mean that they have a greater chance of sucess the next time round.